Planung und Moving Map mit dem elektronischen Kartenpaket Afrika (kompletter Kontinent) für das iPad. Designed specifically for individuals or business aviation, the electronic IFR charts and data-driven enroute charts represent the latest mobile solutions for pilots like you. Available globally in 10 different coverage areas, you will have access to genuine Jeppesen data at a price point that meets your budget. Jeppesen Mobile FliteDeck is a comprehensive, easy to use app based on the highest quality charting and aeronautical data available combined with flight critical weather information and basic route planning. Intuitive functionality, data filtering, and a clear, uncluttered display maximizes navigation situational awareness that allows IFR pilots to focus on flying the aircraft. 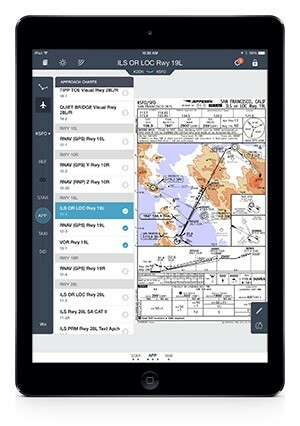 Jeppesen Mobile FliteDeck supports documents, IFR text, terminal charts, enroute data, weather, and route planning. Available as a simple single install, Mobile FliteDeck is easy to download, activate and revise via any Internet connection. Single Install. Annual Subscription Service.